Guess what I did on Monday! 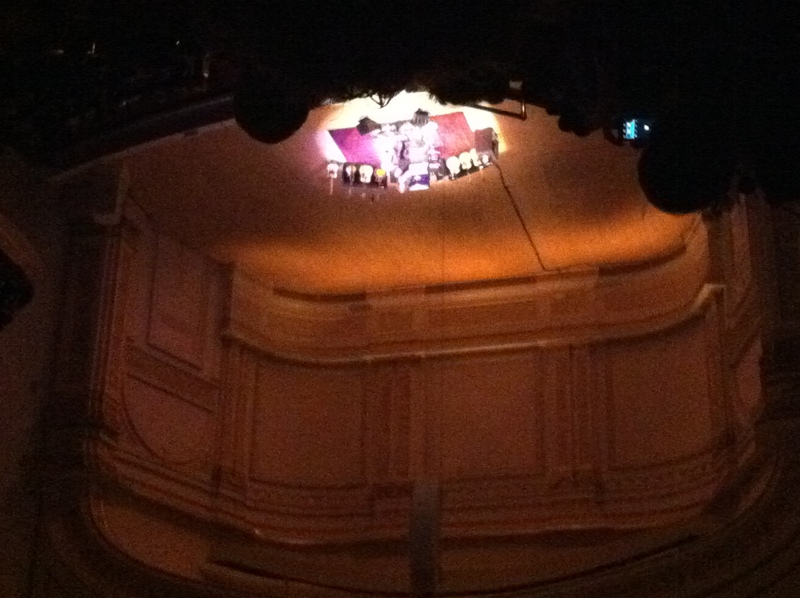 I went to see Chris Cornell perform at Carnegie Hall! Guess how terrible my seats were! THIS terrible (my arms are stretched WAY out)! The little human-shaped blob standing on the classy-looking rug is Chris Cornell. Just believe me. And yet, the show was pretty perfect. I’m happy I decided to go instead of scamming someone else into buying my nosebleed, second-to-last row seats. That man has got a VOICE, and that voice has got some power. He’s also got some serious Soundgarden fans: on the long elevator ride up to our seats, my show companion observed several long-haired devotees packed into our car and stage-whispered “take me to 1994!” Yes, I did lose it. And no, I obviously did not make friends at this show. Still, in the spirit of a holiday that’s supposed to be about being happy and grateful, I thought I’d start with a night that actually made me feel those things. Especially since I’ve been such a lame downer lately. Let me make that up to you with more sweets, dear people. 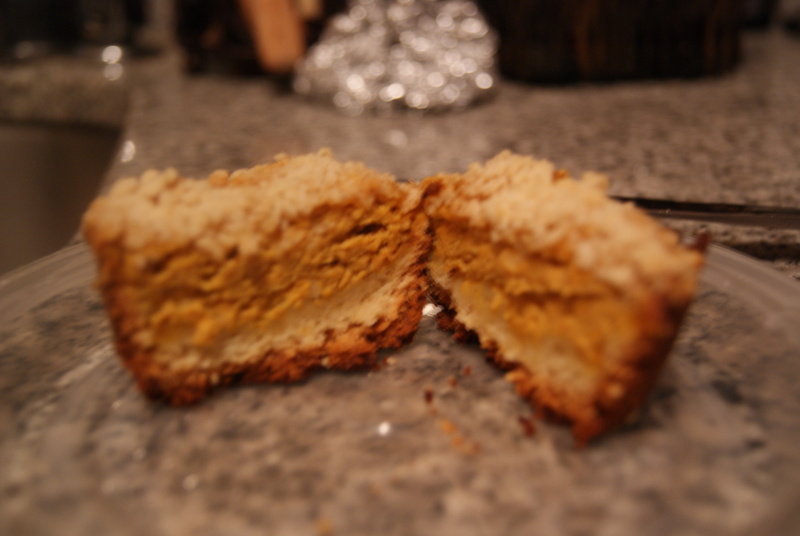 As you guys probably know by now, I like stuffing awesome things into other awesome things to create super desserts. I mean, why have one tasty, amazing and butter-filled concoction when you can have two? And why have them separately when you can just smush them together? Aren’t you always so bummed when you only have room on your plate for a few desserts, so you have to start piling cookies on top of pie slices on top of puddings? I know you all do that too, so don’t even play. I turned these into muffins because I’m an evil human being intent on giving these away to unsuspecting friends and family, and muffins make this so much easier. If you would rather make this as a cake, you can use a 10″ spring form pan for easy removal. 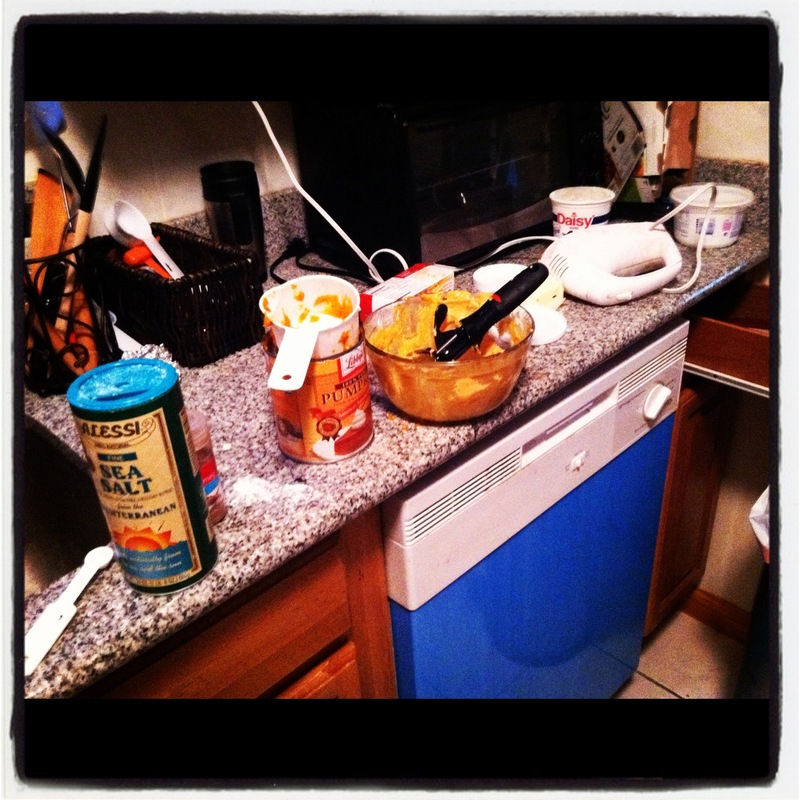 This is to show you what a hot mess I am in the kitchen, and what a beast I am during Thanksgiving. It got worse, I just thought I'd spare you. Preheat your oven to 350°F. Let’s start with the coffee cake portion of this death trap. In a large bowl, sift together flour, sugar, baking soda, baking powder and salt. Throw in your cubed butter and start mixing with clean fingers until it’s formed into little lumpy balls. This might take you a while, and it might feel a little like that pottery scene from Ghost. Don’t go there, though. Instead, set aside 3/4 cup of this mixture for the topping. In a separate bowl, mix together the sour cream, egg and vanilla, then stir into your flour mixture to create a loose dough (don’t overmix). 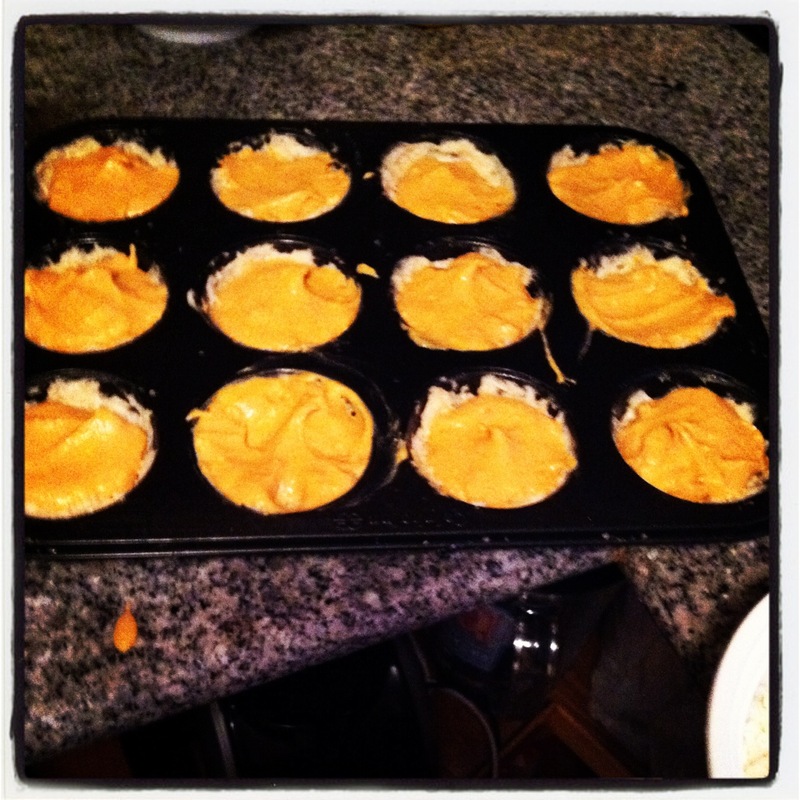 For muffins, mold these into the bottoms and 1 inch up the sides of your tins. It might take a while because the dough gets sticky, so pace yourself. Then, in a medium-sized bowl using a hand mixer, mix together your cream cheese, pumpkin, sugar, spices and salt until smooth. 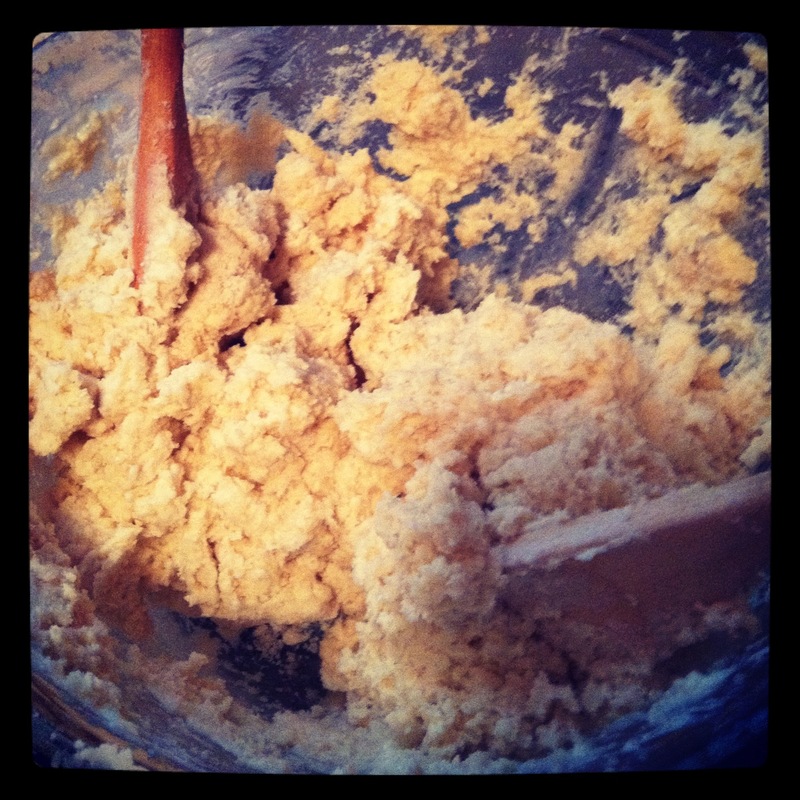 Pour the mixture evenly into your muffin cups, over the coffee cake dough. Sprinkle the crumb topping you’d reserved over each cup, making sure to evenly cover them as best you can. Then send the pans into the oven for 55 to 60 minutes, rotating pans halfway through for even baking, until the sides are lightly browned. Mine came out a little more than lightly browned, because I didn’t check on them at 55 minutes. Don’t be like me. These were still pretty amazing, though, based on all of the “taste-testing” I did. I also gifted one to my coworker and friend, Afshan, and stood behind her going “bite into it! Bite into it” while she picked it up (I realize how creepy that is now, but did not at the time. My bad, friend). She gave it a thumbs-up too, even though I am a creeper. Anyway, since it’s Thanksgiving and one of the only times of the year I grow a soul, I’d like to just take a minute to let you people know how grateful I am that you actually read this thing. It’s funny and touching to hear someone say “I read about it on your blog,” because I’m still sometimes convinced that I’m the only person who sees it. So thanks for making this even more fun than I thought it would be when I started causing trouble in the blogosphere earlier this year. Have a Happy Thanksgiving. We’ll be back to our regular soulless, untouchy, unfeely programming shortly. *Obviously I am joking yet again. Just because I’m a minister doesn’t make anything I say gospel (har har). Except that this dessert is amazing. That’s for real. ← Thanksgiving Is Upon Us. You Should Definitely Hide From Me. Yes, please! Looking forward to Thanksgiving tomorrow and all of the treats I hope you’re bringing. Ha! That’s not shipping film…my dishwasher’s just that ugly! BOOM! Someone just got owned. Looks like an Igloo cooler. If that’s not shipping film that’s actually quite awesome.